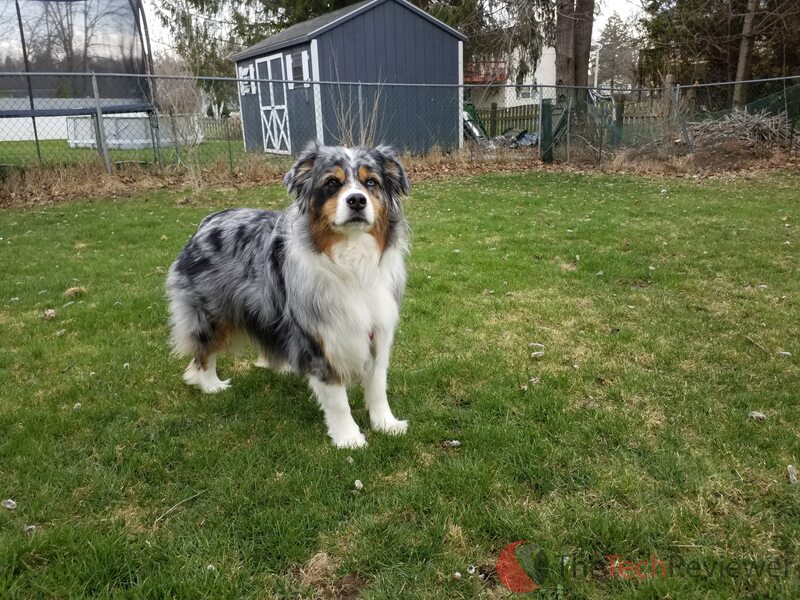 This post is brought to you by CJ Affiliate’s VIP Content Service. Thank you Samsung for sponsoring this post. While this was a sponsored opportunity from Samsung, all content and opinions expressed here are my own. While the general need for a tablet has lessened over the years due to the increasing size of flagship smartphones, tablets are offering better designs and features to cater to mobile gamers, power users or business customers. 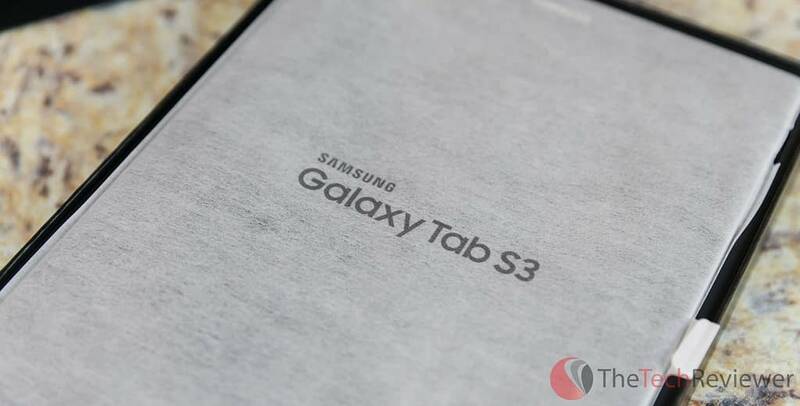 The Galaxy Tab S3 is Samsung's newest flagship tablet that serves as a multi-purpose device for productivity, creation, gaming or media consumption. Priced at $599, the Galaxy Tab S3 ships with its signature S-Pen Stylus with an optional keyboard accessory that sells for $129. 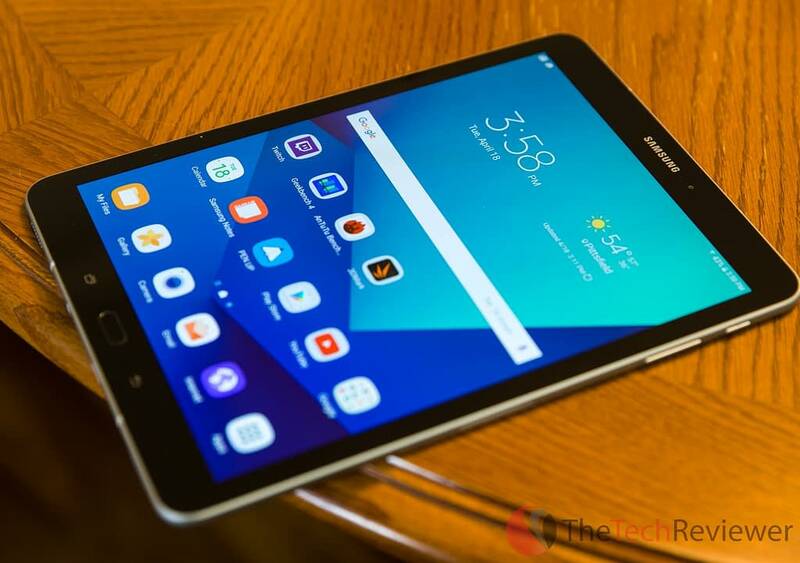 Samsung provided us with the Galaxy Tab S3 to use on a temporary basis and give us a change to provide a detailed, unbiased review of our experience with the tablet. 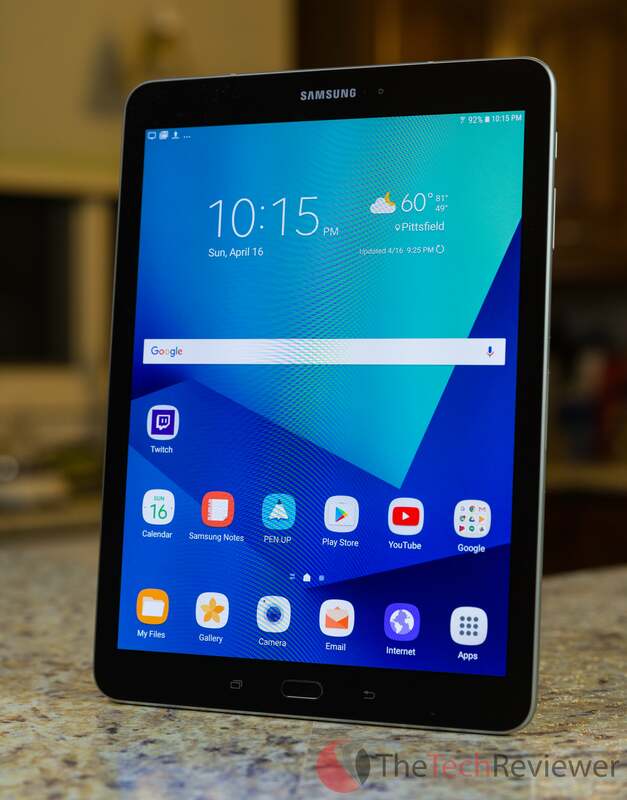 In the following article, I’ll discuss my use of the Galaxy Tab S3 over the course of a 14-day period. 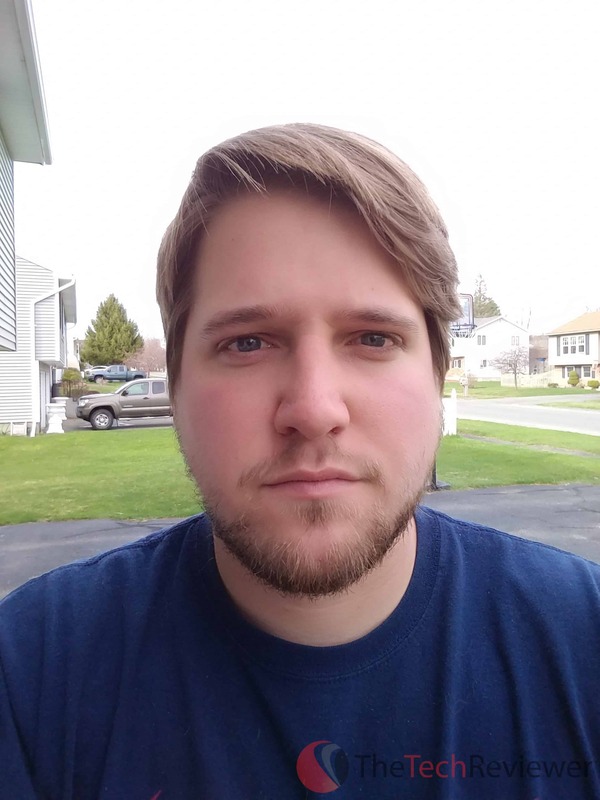 While this post was made possible by Samsung, all opinions expressed in this article are solely mine based on my personal use of the product. 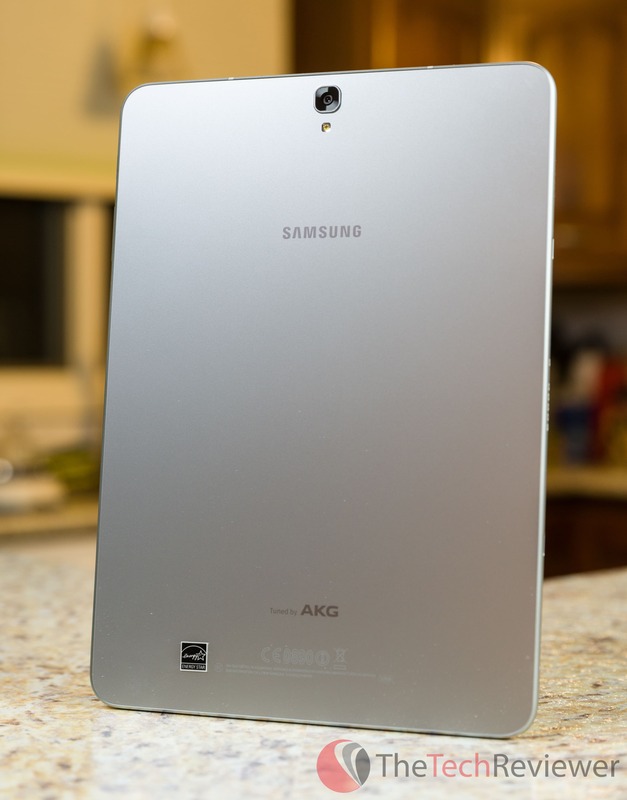 The Galaxy Tab S3 fits the same design as previous generations with a similar body style. From the front, it looks nearly identical although the rear of the device now harnesses a glass back offered in either a black or silver (our sample) finish. While the look of the glass back is dramatically better than the rubberized plastic finish of its predecessor, I do find the Tab S3 more slippery to handle, and the finish has a tendency to gather notable fingerprints and smudges. Adding a case whether it be one of Samsung’s Book/Keyboard cover cases or another aftermarket version helps aid these issues. The Tab S3 is slightly bigger and heavier than the previous S2, but the difference is marginal, and it remains smaller/lighter than Apple’s competing iPad Pro 9.7″ model. From a design standpoint, the S3 remains an impressive feat to fit such a feature-packed tablet into such a thin design. The front bezels surrounding the display are still rather large and something that can be improved upon in future variations. 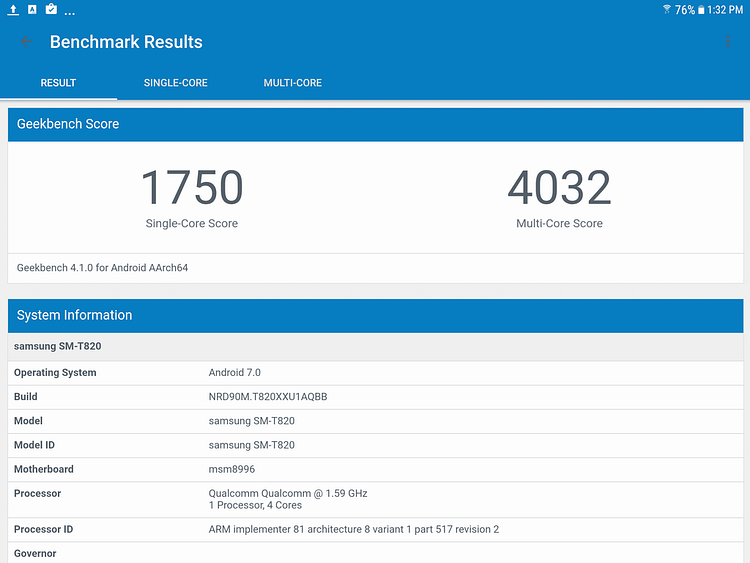 You’ll find the same fingerprint sensor used on other modern Samsung devices located at the bottom middle of the device face alongside capacitive touchscreen versions of the usual ‘back’ and ‘recent’ Android controls to the left and right of this sensor. 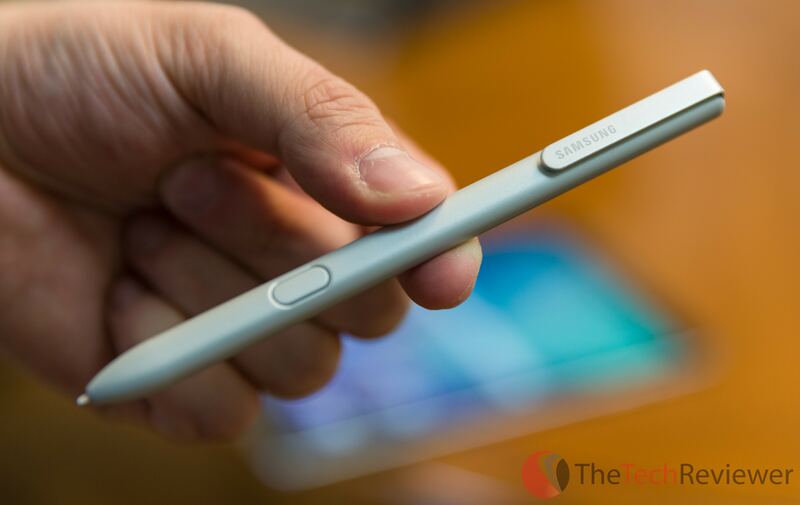 Unlike the previous Tab S2 model, Samsung decided to swap out the microUSB port for the more modern USB-C equivalent. This is a pain for some of us who have legacy charging accessories that are microUSB, but it is evident that USB-C is the future and will outlive the microUSB connection. It is an inevitable transition that is also being carried over to their smartphones like the S8 and S8+. 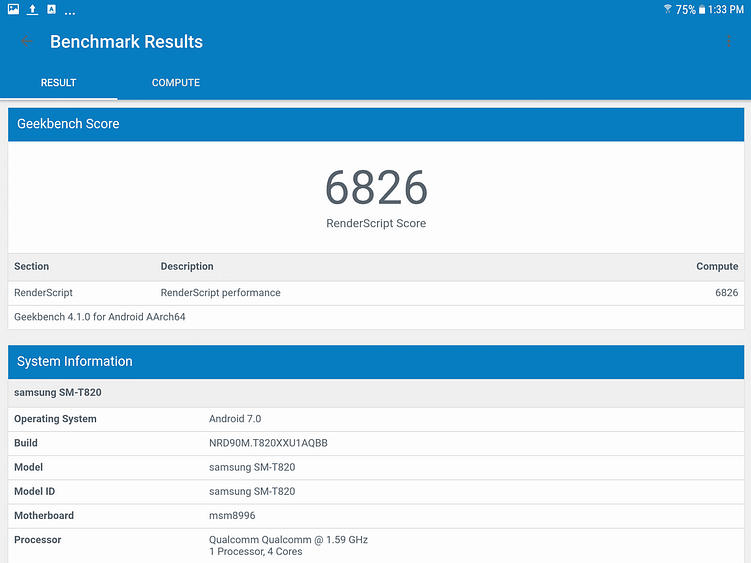 One of the biggest selling points of the Galaxy Tab S3 is a new HDR-ready Super AMOLED display with its Quad HD resolution (2048px by 1536px). Samsung opted to bring the screen into the HDR10 standard (a first for tablets) over making a ridiculously high-resolution panel such as 4K. 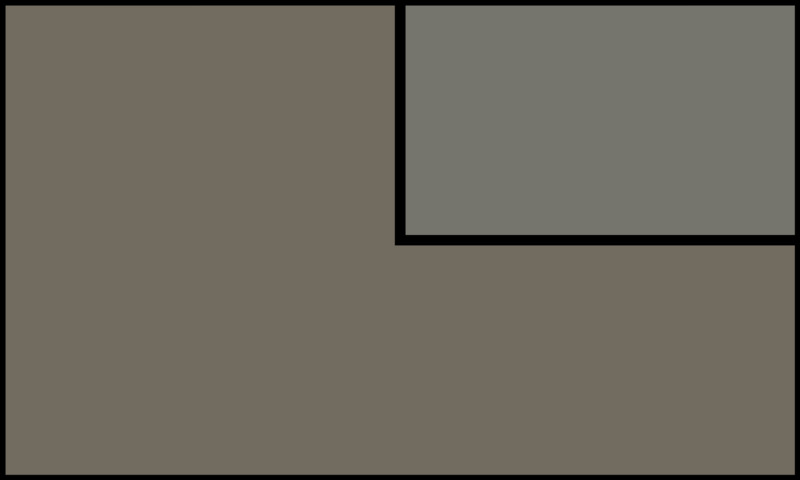 On a screen this size, you’ll get a lot more satisfaction out of the increased contrast ratios and brightness ranges with the introduction of HDR10 than squeezing more pixels into a panel that is already a high resolution. 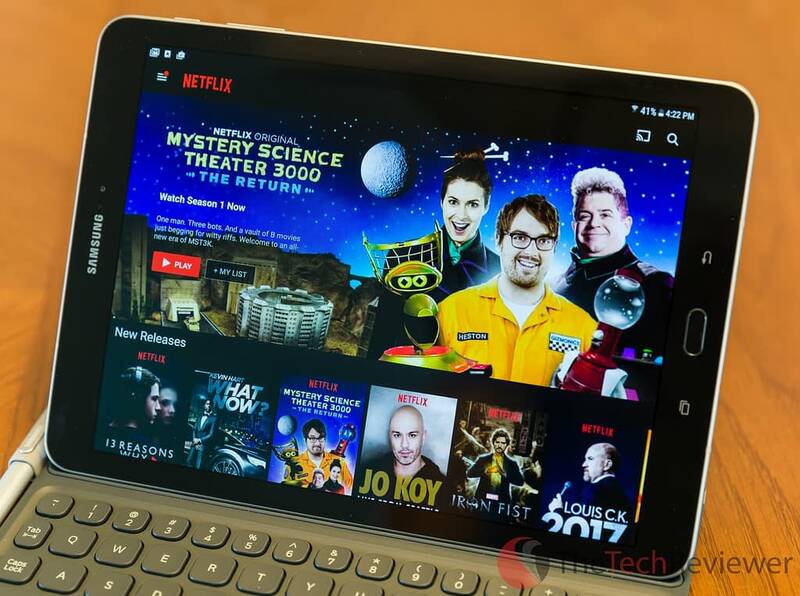 Putting an HDR display in a tablet at this point is kind of a double-edged sword as it is a great feature and highly competitive in the current market, it is also ahead of its time as services like Netflix, YouTube, and Hulu are not yet supporting HDR streaming on mobile yet. While I expect these to happen shortly, you won't get a lot of opportunities to view HDR content until streaming providers release support for it on their mobile apps. 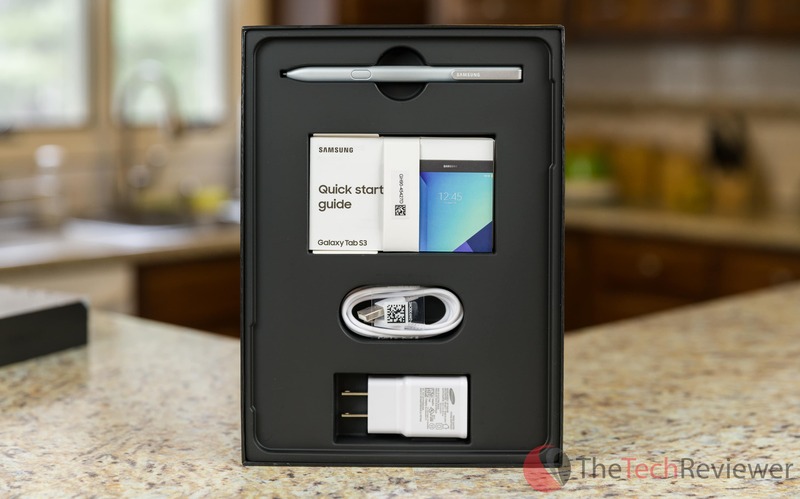 Samsung updated the audio components to now include four speakers, one in each of the corners which makes for a more even flow of sound regardless of device orientation and a lesser chance that you’ll block your primary audio source while holding your tablet. There is still a physical headphone jack as well for those who want to game or watch video content/stream music in a public setting. The included S-Pen is revised to offer better performance and sensitivity. Like the previous generation version, it does not need to be charged which is a great benefit compared to the Apple Pencil. It does not have a native way to dock or attach to the Tab S3, so when you are “on the go” you’ll have to throw it in your pocket, a bag or invest in a case that includes a stylus loop. 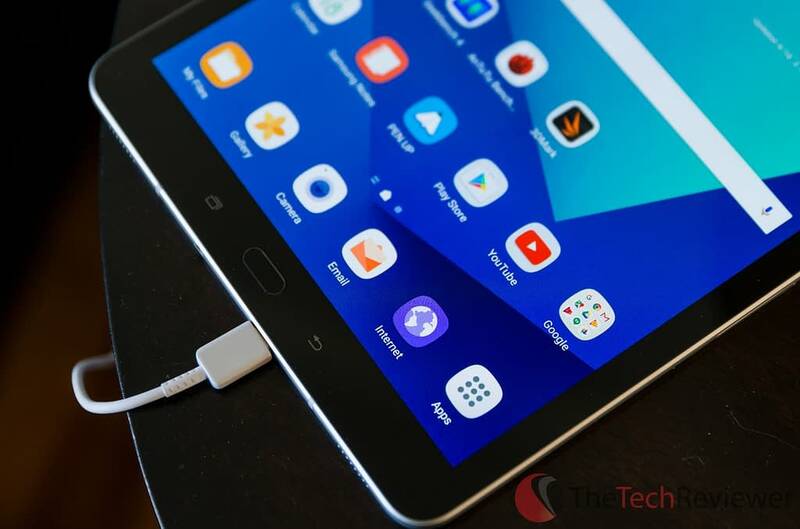 Internally, the Tab S3 is running a Snapdragon 820 processor, a common chipset used in many Android smartphones in 2016 including the Galaxy S7 and S7 Edge. 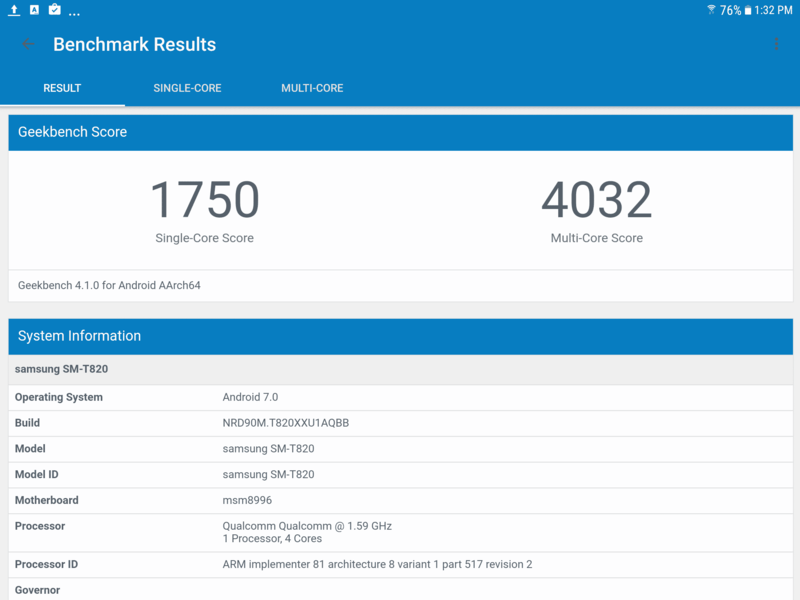 While it is technically a last generation chip, this is the first time we see it being used in a tablet and is packed alongside 4GB of RAM. The internal storage comes in at 32GB which is a good base, but there is an expandable memory slot that accepts microSD cards up to 256GB. The battery is slightly larger than the last generation (5,870mAh) with a bump up to 6,000mAh. Samsung’s marketing materials state this battery offers up to 12 hours of video playback. While this is a step in the right direction, we see significantly larger batteries in competing tablets such as the iPad Pro 9.7 (7,300mAh), so my guess is they had to choose the competitive advantage of a slimmer profile over matching their competition's battery capacity. The Tab S3 supports fast charging so it can charge the battery in its entirety within three hours given it has an appropriate power source. 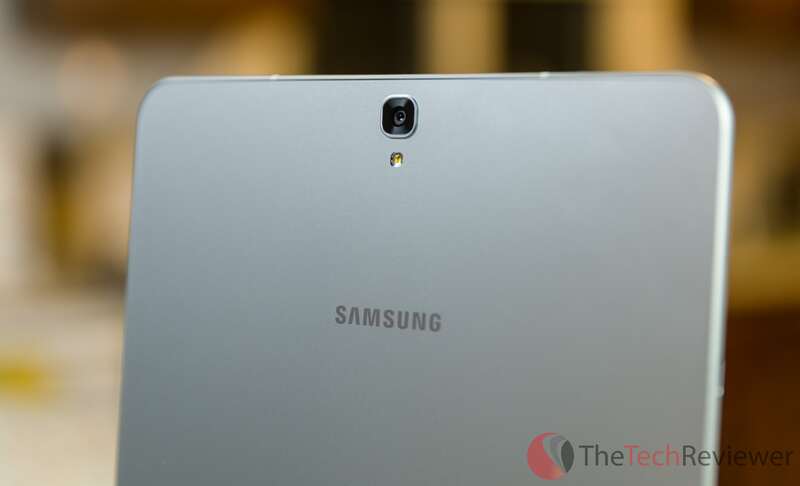 From an imaging standpoint, the Galaxy Tab S3 is well equipped with a 13MP rear camera. This rear camera offers many of the advanced features you could seek like autofocus, flash and an aperture of f/1.9. Videos shooters can use this rear camera to shoot up to 4K UHD (3840 x 2160). The front-facing camera harnesses a 5MP sensor and f/2.2 aperture which gets the job done for video chatting and selfies although you’ll want to ensure you have ample lighting for both situations. In the end, the form factor of a tablet (and general awkwardness of taking tablet photos in public) is still far from ideal for mobile photographers. I’d anticipate most of you won’t be buying a tablet for its camera other than reference shots for work or school and it will excel in both of these areas. If you opt to spend the extra $129 for the Keyboard Case, you’ll get the full experience of a physical keyboard without sacrificing much regarding bulkiness. The one piece design features a full QWERTY keyboard attached to a thin protective case. 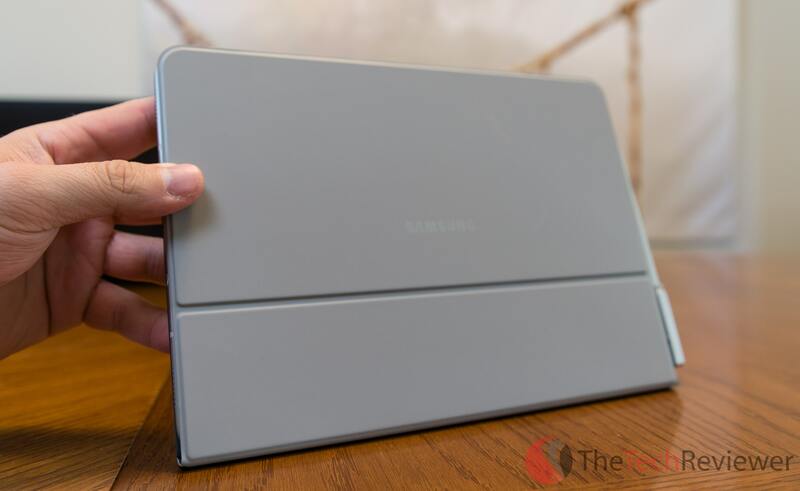 Oddly enough, the Keyboard Case attaches to the Tab S3 magnetically. 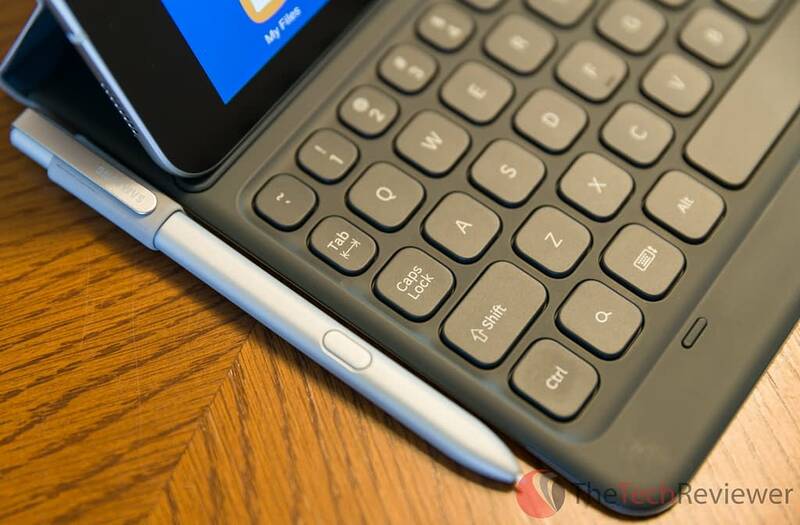 The result is a surprisingly good implementation that can be removed quickly if needed.By utilizing the connection pins on the Tab S3, the keyboard does not require its own power source, so you’ll never need to charge it. It will also connect instantly so no need to go through any lengthy pairing process. The case ships with an S Pen loop attaches to the left of the case and neatly stores your stylus when not in use. They made an oversight in that the keyboard case does not offer any cutout for the rear-facing camera and blocks it entirely when attached, so you'll need to remove the Tab S3 from the Keyboard Case to snap a photo with the rear camera. 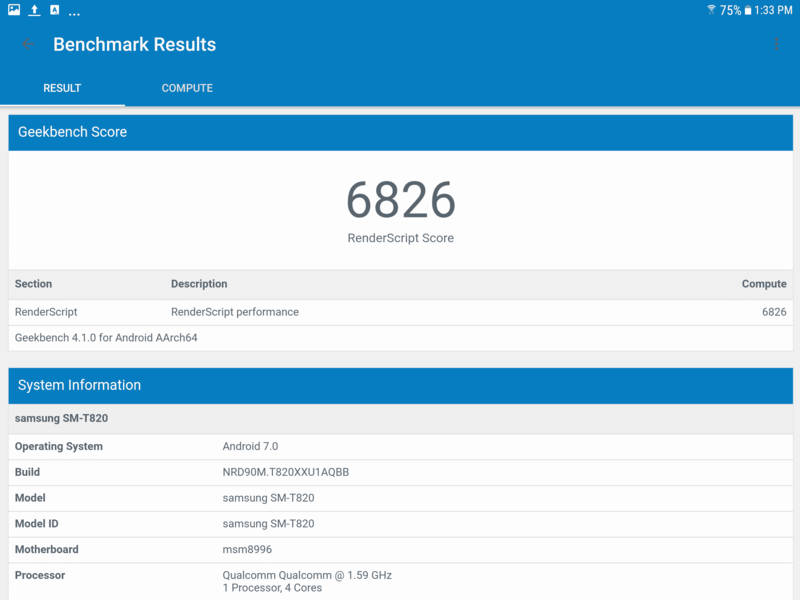 As you’d expect Samsung shipped the Tab S3 running Android 7.0 Nougat which is the latest and greatest mobile OS from Google. Unfortunately, it isn’t stock Android, and you’ll be stuck with Samsung's notorious ‘TouchWiz’ software overlay. While TouchWiz has gotten a bad rep in the past, Samsung has toned it down enough to make it more than bearable though it remains less than ideal compared to the stock version of Nougat. Notifications and quick settings are well implemented including a searchable settings menu. Flipboard remains present so the latest news can be quickly accessed via a left swipe on the home screen. The ‘secure folder’ offers privacy of sensitive data files and can even create duplicate version apps for secure access. While the S2 had split-screen support, it didn’t officially come to Android until Nougat. The good thing is at this point we now have more apps that natively support multitasking. The native Samsung Notes app allows for both text and written note taking, and I've found it to be sufficient for my needs. On the other hand, the stock PEN.UP app is ideal for artists and gives an outlet to share drawings or creative works using the S Pen. You always have the option to utilize a third-party note-taking/drawing app for use with the S Pen as there are several alternative apps available within the Google Play store including Autodesk’s SketchBook. For the first time on a tablet, Samsung Flow is present allowing integration with your Samsung smartphone with wireless file transfers, shared notifications, and SMS/call access from the Tab S3. This is only relevant for those that have a recent Samsung Galaxy device like the S6/S6 Edge, S7/S7 Edge or Note 5. 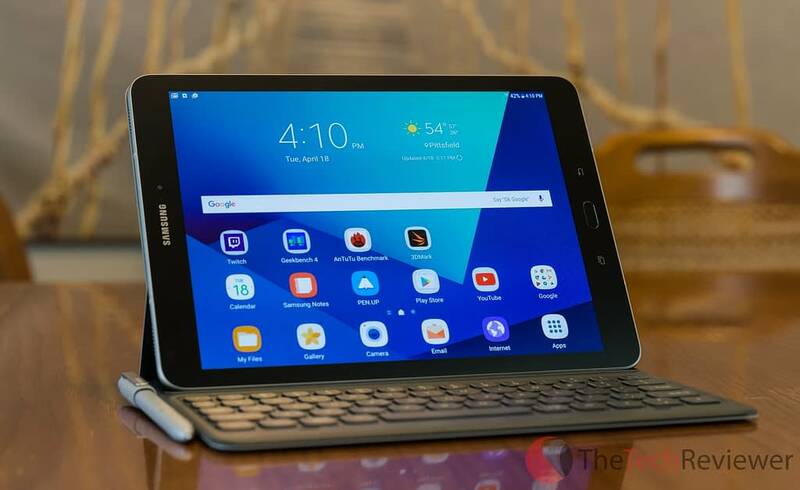 Handling the Galaxy Tab S3 is a similar experience to most modern tablets as the 9.7” form-factor is both functional and practical. I wouldn’t have wanted anything bigger (too cumbersome) or anything smaller (too much like a smartphone). While the glass back of the device is elegant, it gets slippery, so I’d recommend throwing a case on the device to ensure a better grip and some added protection or at the least throwing a dBrand skin on it. Handholding the tablet is easier with the new four speakers design as you won’t accidentally cover your primary source of audio. The S Pen feels good in the hand, and while I prefer the round design of the Apple Pencil compared to the S Pen, the smaller size is more appropriate for a stylus. I still wish the S Pen could be stored inside the tablet similar to the Note models as it becomes a nuisance to carry around for “on the go” tablet use, but this can be remedied by purchasing a case that offers S Pen storage. If you opt for the keyboard case, the overall experience is good, but not great. While I appreciate the slim size and protection benefits, the lack of a hinge allows use at only one viewing angle and the typing experience leaves something to be desired. The key travel is nice and crisp (thanks to chiclet keys), but the layout feels overly cramped, and I found myself regular typing mistakes leading to frustration over time. 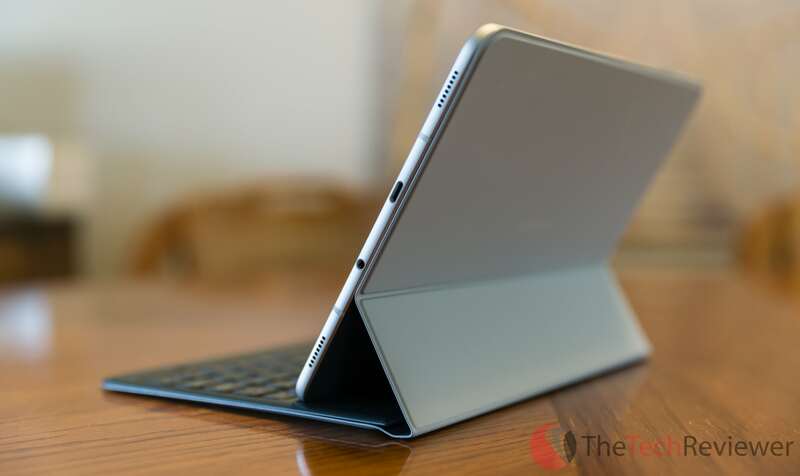 I think those that need a keyboard case would not mind sacrificing the thin size for something with a dedicated hinge and better key spacing something similar to the Clamcase series for iPad which improves upon both of these areas. 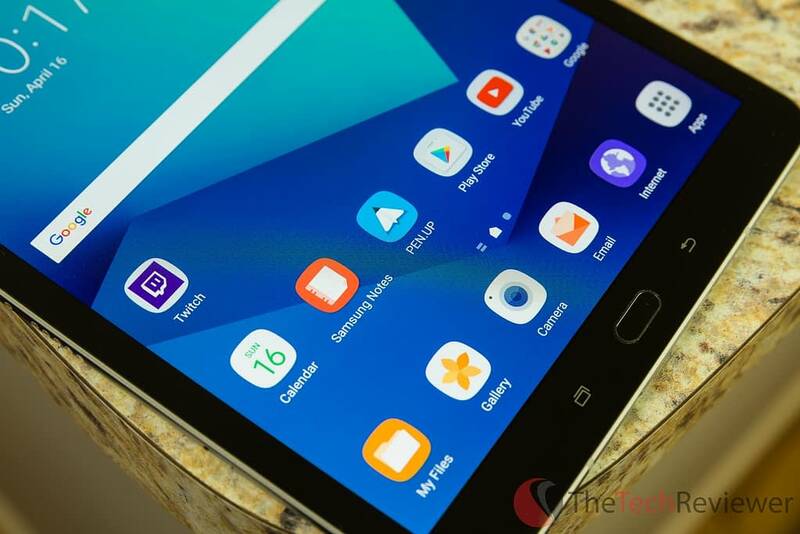 The Galaxy Tab S3 handles basic and complicated tasks with excellent speed thanks to a bump in processor and RAM compared to its predecessor. Navigating through the UI is seamless, and the Nougat/TouchWiz combination makes for a pleasantly efficient experience overall. From the benchmarks, you can see a significant boost in processing power for the single-core whereas a slight loss in the multi-core score from our testing. 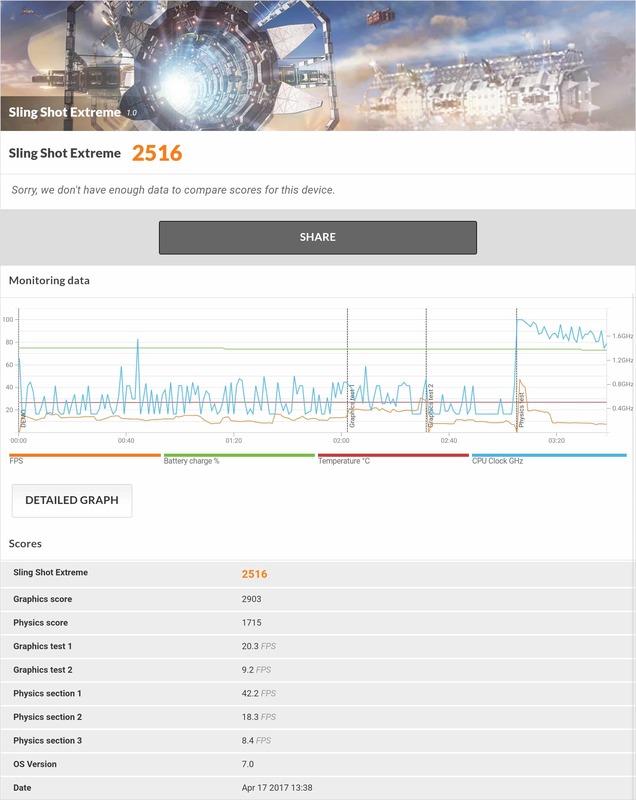 The Tab S3 well on the graphics benchmark so it should handle most mobile games, but there is certainly room for improvement from an FPS standpoint. While Samsung boasts twelve hours of battery life, I was experiencing more along the lines of ten and a half. As always, battery life will vary from user to user depending on a multitude of variables including screen brightness, applications running and external connections (Bluetooth, Wi-Fi). Since I fall into the power user category, I expect these numbers to be more towards the advertised amount for an average user. 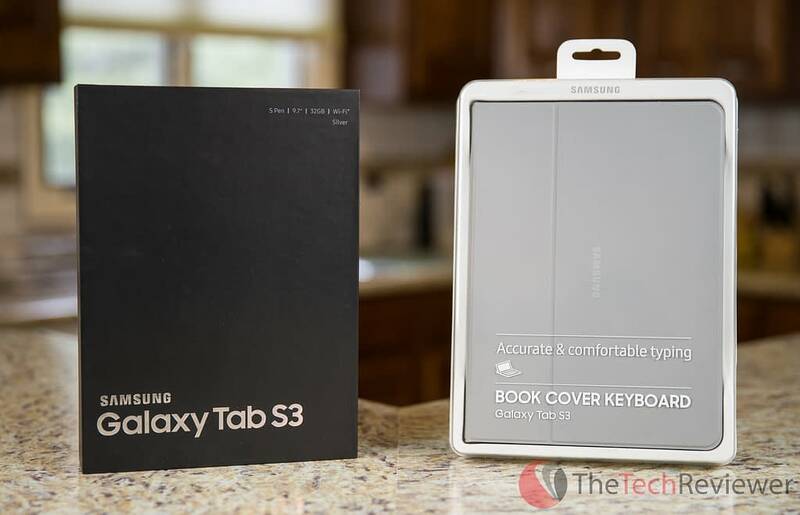 Samsung’s Tab S3 is the best Android tablet on the market today and the improvements made over last year's Tab S2 make it a worthwhile purchase for any prospective buyers. 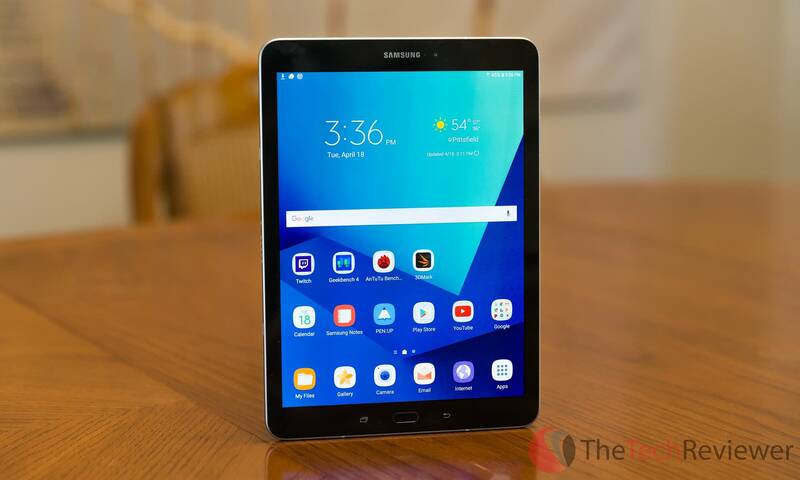 The Galaxy Tab S3 is an ideal choice for consumers familiar with the Android OS who are looking for a device with a large, high-resolution HDR display for gaming, media consumption or productivity purposes.